Date and Venue Tuesday, March 10, 2015 at 8pm | Electric Owl, 926 Main St.
Tonight is the North American debut of the Dead Combo, an award winning guitar duo from Portugal with guitarists Tó Trips and Pedro Goncalves. The Electric Owl works hard at creating the perfect ambience for this performance with candles on the tables at the back level. On stage are several electric guitars and the stage has flashing images in black and white to build a climax for the entrance of the guitarists. We are seated in the front row. In retrospect we would have preferred to be further back since the sound is fairly loud. The Electric Owl is packed and there is a huge applaud as Gonzales in black and white 30s button down shoe spats and Trips in his white shoes and tall hat enter the stage. Trip’s hat is right out of Dickens that totally and intentionally obscures his face. Trips keeps his head down throughout the performance so it is quite a surprise to see his face at the end of the evening. They are described as to having the appearance of an undertaker and a gangster. Goncalves plays electric guitar, keyboard and double bass and many other sounds that are truly unique. Trips plays a mean guitar but adds some significantly unique sounds with his feet and a record that he zips across the guitar strings. The sounds are bizarre and Trip’s guitar is singing with difficult guitar sliding techniques and picking. Goncalves plays the Melodica which is a harmonica with a mouthpiece and a keyboard and produces some cool sounds. I like to see something refreshingly new in both visual and in sound and Dead Combo is definitely that. These guitarists have a profound sense of multi sound arrangements and extremely talented guitar playing. They have won the “Record of the Year” and “Record of the Decade” in Portugal. 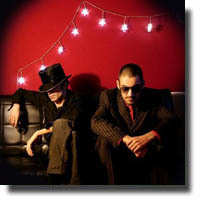 If you like great instrumental talent then make sure to look Dead Combo up on the internet to hear their distinct sound. It’s a combination of jazz, Portuguese folk, and cinema soundtrack and a bit of Western.